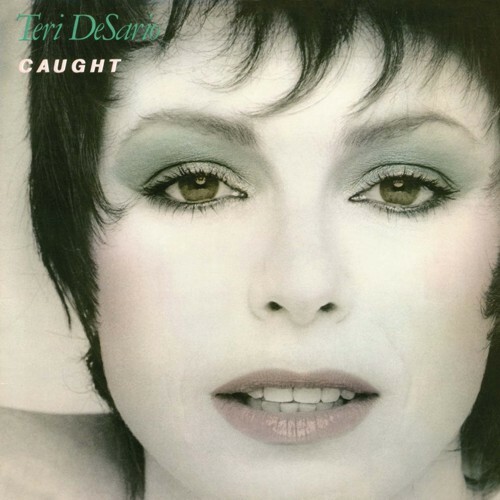 Originally signed by Casablanca Records in the late 70s as a pop/disco artist, Florida's Teri DeSario had tasted moderate success with a couple of minor hits from her first brace of albums and a major one dueting with former schoolmate Harry Wayne Casey (a.k.a K.C. of Sunshine Band fame). It was suggested to Teri that she make a rock album with the cream of L.A. session musicians to rival rising stars like Pat Benatar and Kim Carnes, and as the label would let her keyboardist/songwriter/producer husband handle the project, she readily agreed. 'Caught' came out back in 1980, and despite disappointing sales it has always been seen as a minor classic, well-respected Kerrang! journalist Paul Suter even selecting the title track for the 'Striktly For Konnoisseurs' compilation he put together a few years later. Like seemingly many others (sleeve essay writer Dave Reynolds included), I picked up the album early on mainly because of the calibre of the musicians involved - guitarists Steve Lukather, Richie Zito and Michael Landau, bassists John Pierce and Dennis Bellfield, drummers Mike Baird and Carlos Vega, and keyboard players Steve Porcaro, David Foster, Michael Boddicker and James Newton Howard! Initally there's no bigger hook than that of the title track with its poppy verse and speeded up guitar-driven chorus, whilst the smooth AOR of the day was well represented by the catchy 'Time After Time', the quirky 'I Hate You' and 'Standin' On The Edge' with its memorable chorus and no less than two searing guitar solos from Lukather and Zito. Teri's voice was close to Benatar's with a similar amount of control through the gears, although it does sound that Teri had a couple of extra gears she barely used, like the full-on Lee Aaron-style roar on the charmingly addictive 'Hittin' Below The Belt'. There are a couple of gentle ballads in 'All I Wanna Do' and Desmond Child-penned 'I'm With You Now' - whilst to this day I find ending the album with The Beatles 'I Should Have Known Better' makes me switch off the album early. The best track of all is the moody rocker 'I've Got A Secret' with its dramatic vocal and killer Lukather/Landau guitars. Personally, 'Caught' isn't the absolute classic that some people make it out to be, but for the most part it's a very good example of female fronted 80s AOR. Some albums are consistently good but don't have any really outstanding songs, some have some absolute corkers and a bit of filler, this latter applying here in that I'm drawn to and will regularly blast out 'I've Got A Secret', 'Caught' and 'Standin' On The Edge' until the day I pop my clogs. The album has been well remastered by Andy Pierce - although it doesn't have the sparkle that Rock Candy's other 'go to' guy Jon Astley would probably have brought to the table - and Dave Reynolds tells the interesting story. Good to hear that Teri is still out there making music, albeit not in the style some of us would prefer her to.